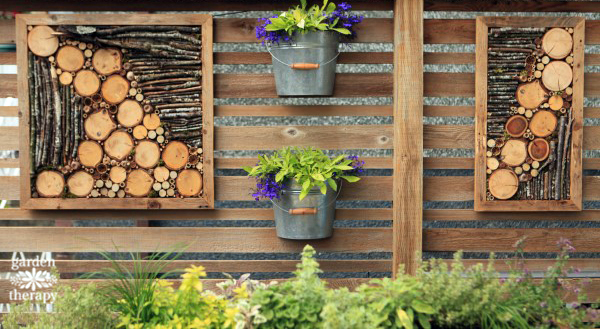 If you have an eyesore of a fence, or even just want to add some deck decor, this Bug Hotel Fence Art is the perfect fit! 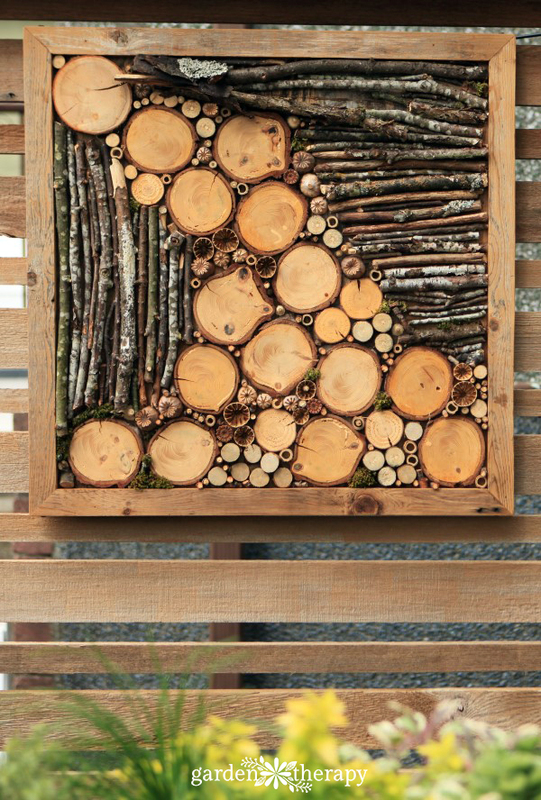 Natural and found elements such as branches, seed heads, bamboo, and moss are set in a wooden frame as four-season art. With materials collected from the garden it looks right at home as the backdrop to the outdoor dining area. I’m a huge fan of decorating outdoors. Since I’m also a huge fan of supporting beneficial insects, it seemed like the right idea was to create a pleasing bug hotel that also doubled as artwork. If you’re looking to make a proper bug hotel, head over to this post and see how to make a structure that’s deep enough to support all sorts of different insects like solitary bees, lacewings, ladybugs, and more. This bug hotel fence art has all the elements of a bug hotel but it doesn’t have a lot of depth. 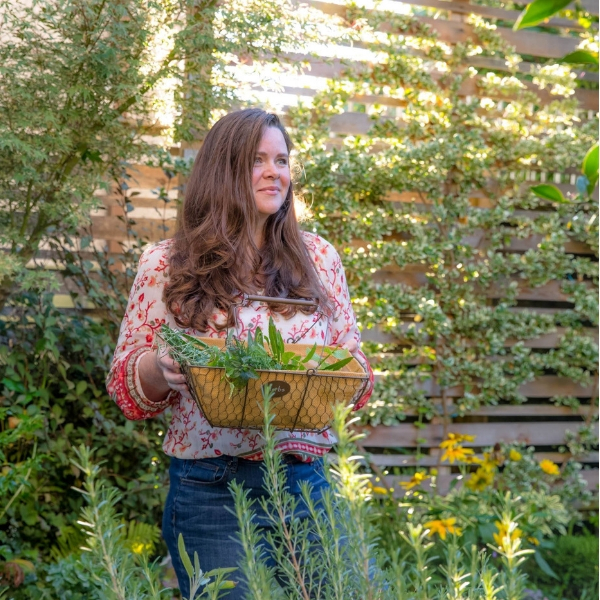 It has a few holes and crevices that little bugs could nestle into for a winter’s nap but its main intention is to decorate the fence and create a backdrop to the outdoor dining area. Sticks, branches, seed heads, bamboo, moss, and more. 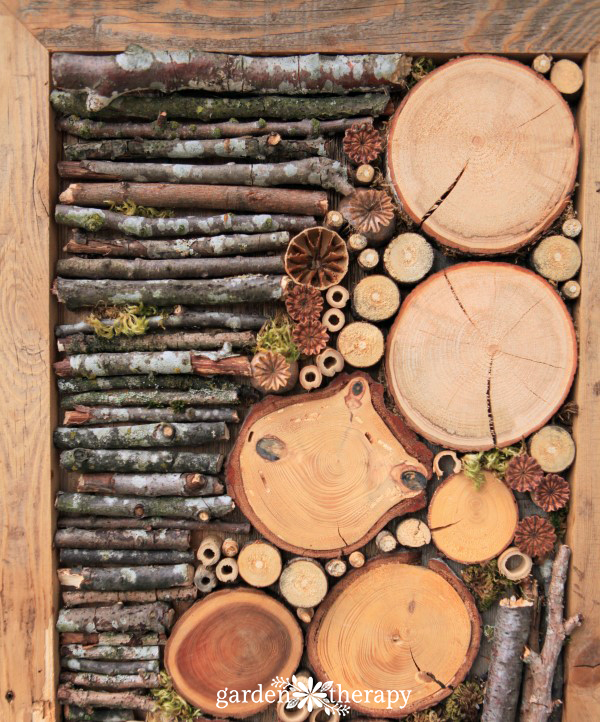 To make your own bug hotel fence art, first things first: head out and collect materials. Look for materials from your garden or surrounding neighborhood and you will have an original piece that is truly art imitating life. Choose straight branches with interesting lichen and mosses on them. Find some large branches that can be cut into slices. 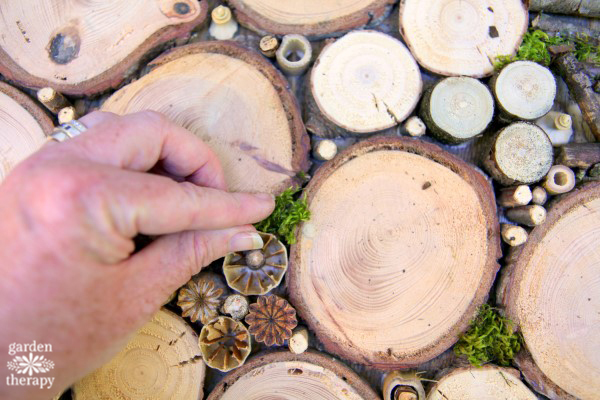 Look for wood that has interesting marks, insect holes, and other tracks that will add a little bit of character to the art piece. To assemble this artwork you’ll first need a frame that is weatherproof and can last outside throughout the seasons. 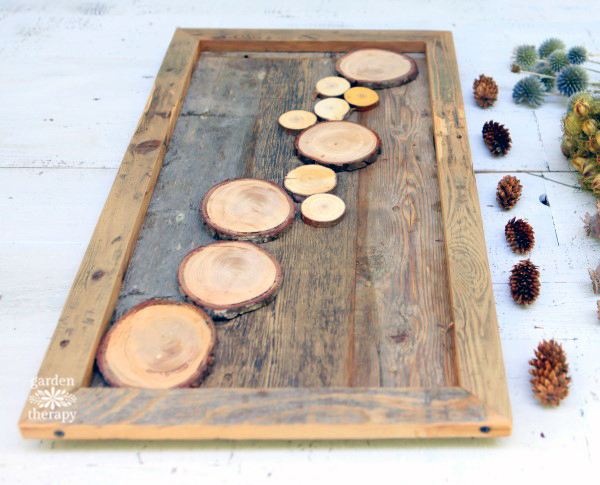 *The frame I used for this project was custom made out of reclaimed barn wood. I’m working on creating a PDF for how to build the frame and will post it here when it is completed. 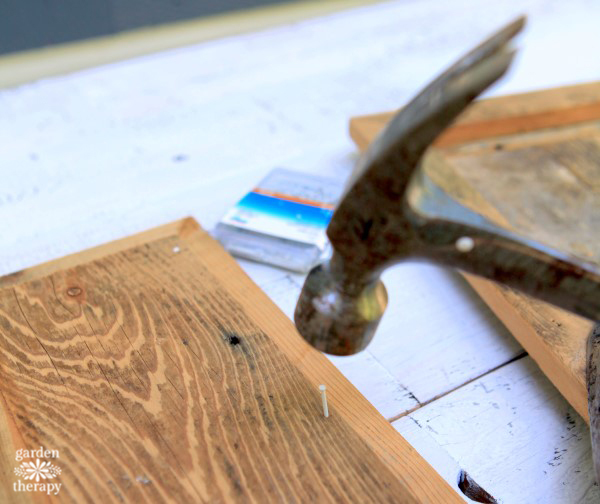 In the meantime, you can purchase a wood frame and use wood glue and nails to attach a frame backing cut from a piece of plywood. After you have built the frame, now you can get creative in designing the art! 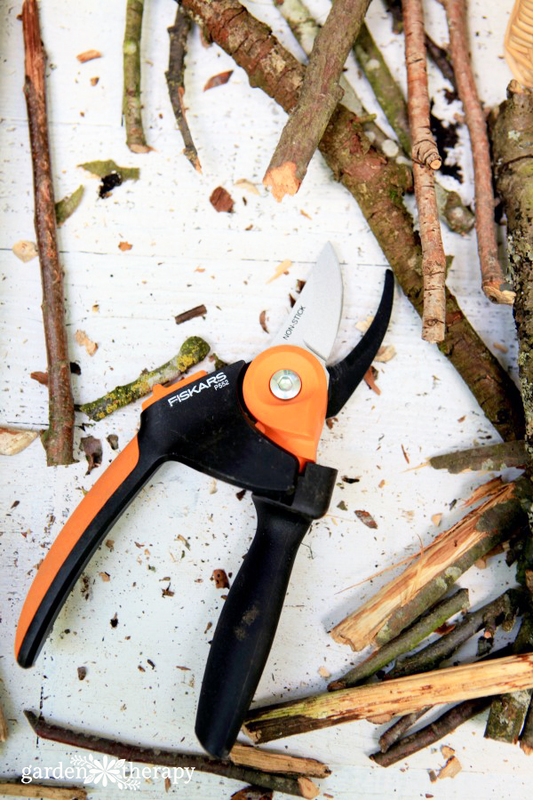 Arrange all of your materials and get a powerful pair of pruners that can handle the job of cutting through thick branches. Otherwise, you will have to saw every single piece of wood for this project and it will take a lot longer. I used these which I was sent last year for fall clean up and removing suckers from trees. 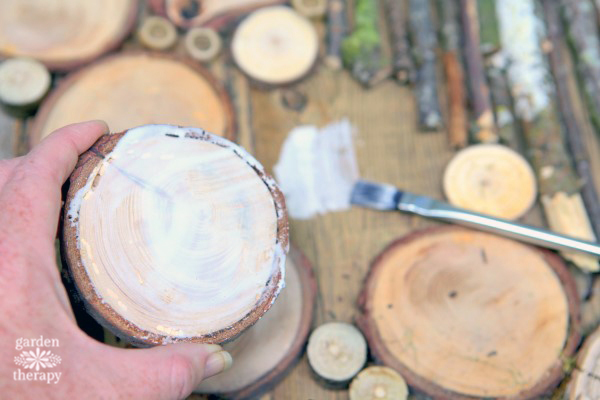 The wood slices were cut with a table saw and you can see how to do that in this post on how to make natural branch coasters. The other elements like bamboo reeds and poppy seed heads were hand sawed to get them to just the right shape. Once you have all of your elements cut, begin to lay out your design. I started by creating a wave of cut wood slices diagonally across the frame. I then filled in more space on the edges with cut branches. The tinier pieces were put in afterward in a random pattern that added more detail and decoration. Glue all of the elements down using wood glue. This is best done by lifting them up one at a time, adding the glue to the back and then setting them back down. Wood glue is wonderfully adhesive and will affix the elements to the wood backing in only an hour. Finish up by adding some moss into any open spaces or corners that look like they could benefit from a little bit of green. 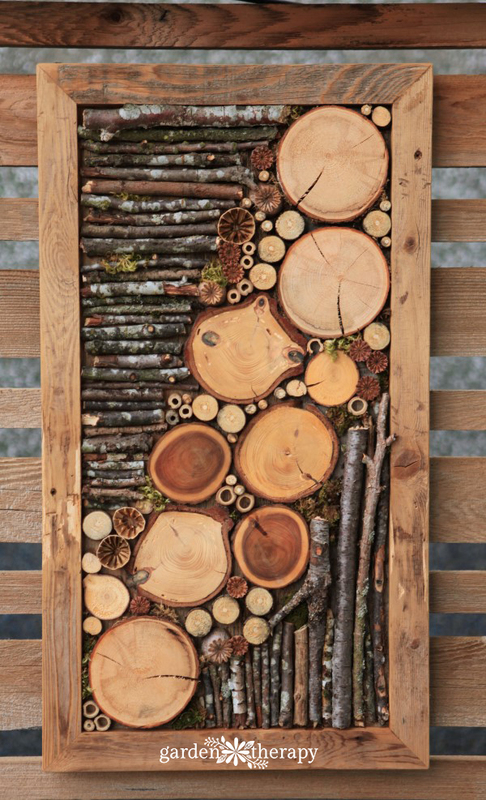 After all the elements are glued, there’s no need to seal or varnish your bug hotel fence art. Unfinished wood is also more inviting to bugs looking for a place to snuggle in for the winter. If you are not interested in having this as a home for insects but are more interested in protecting the wood from any discoloration, brush on a coat of water sealer to protect the finish of the wood. I absolutely love this idea! So creative .Thank you. This is very useful. I will certainly come back to this post when I want to male my own bug hotel. Thank you! Wow! It’s so beautiful! 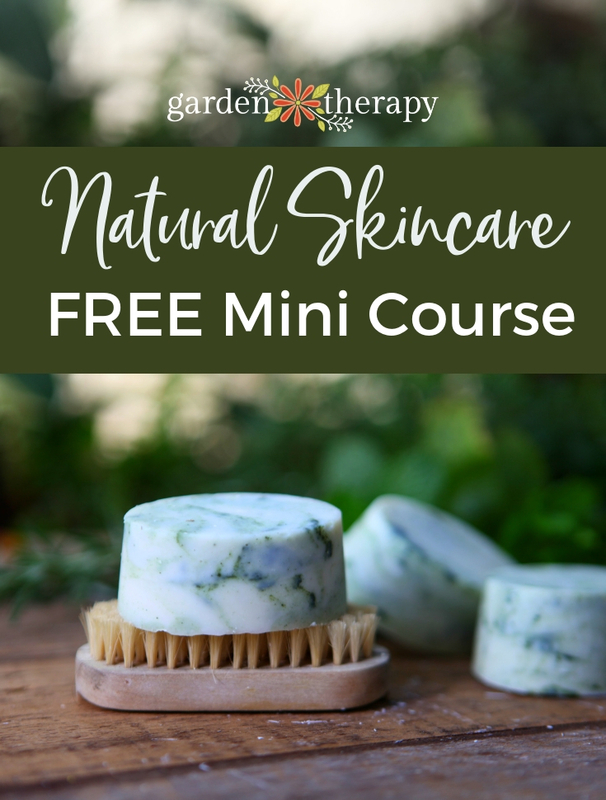 I love your idea~ Thank you for sharing the tutorial! Gonna try it!